Starting in Ogallah, right off Interstate 70, we headed south into a brisk wind that kept throwing tumbleweeds our way. Rolling over gentle hills, the byway was bordered with the emerald green fields of recently drilled wheat and the deep red of milo waiting to be harvested. About halfway to Brownell, a large limestone church loomed up from the Kansas countryside. The Swedish Lutheran Emmanuel Church was built in 1902 to serve the Swedish immigrants to this area of Kansas; the church walls stand strong against the Kansas winds more than 110 years later. Our next stop was at the Cedar Bluff State Park, home to the Threshing Machine Canyon, a site of a Native American attack on travelers taking a threshing machine to Brigham Young in Salt Lake City. Here you&apos;ll see limestone bluffs along the water&apos;s edge, along with plenty of opportunities for wildlife and fossil sighting. At the town of Brownell, you&apos;ll head west toward Ramona, then back north to Wakeeney. 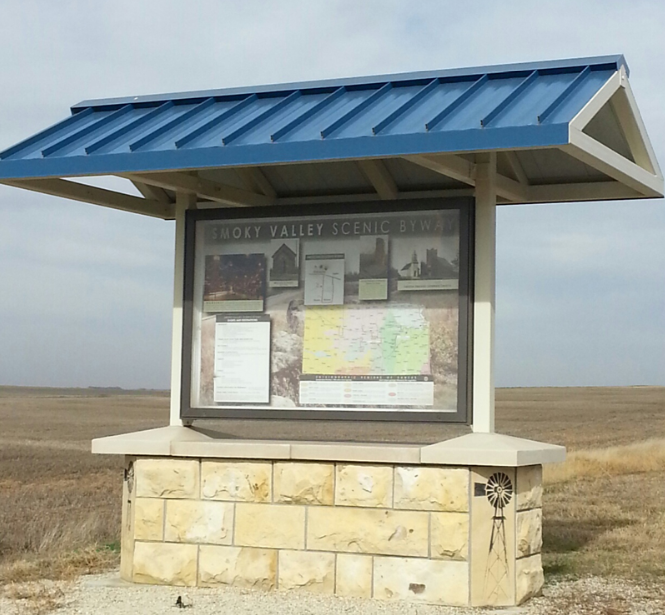 Although we missed the markers in all of our gawking at the wide blue skies and Kansas fields as far as we could see, there are two markers indicating where the Butterfield Overland Dispatch crossed this area, carrying mail and freight west in the late 1800&apos;s.
Our next photo stop was at the Wilcox School. This one room schoolhouse was erected in 1886 from local quarried limestone from the nearby Smoky Hill River. Used not only for schooling of the Wilcox area children, the building also served it&apos;s community members through draft registration, as a voting headquarters and many other community events. It even became the headquarters of the Gravel Grinders Motorcycle Club upon its closure as a school. Within the doorway of the schoolhouse, you can find names carved into the soft limestone from as early as 1901. Our final destination along the byway was in Wakeeney, also known as the "Christmas City of the High Plains". Here we found a veteran&apos;s cemetery, as well as a deep sense of pride in the area&apos;s veterans. Downtown, you&apos;ll find several spots to stop and explore, including the "North Pole", located between two limestone buildings. Santa&apos;s workshop includes a mural along the south wall and I&apos;m sure has been a memory of Christmas in many young minds over the years. This byway was a great ride to get away from the modern world and see the uncommon beauty of fall in Kansas. It&apos;s a great ride to unplug, unwind, and explore.